A few weeks ago I got an email from my bother-in-law Scott who was in a highly agitated state. He told me he had been the victim of fraud perpetrated by the Bird’s Eye Company. 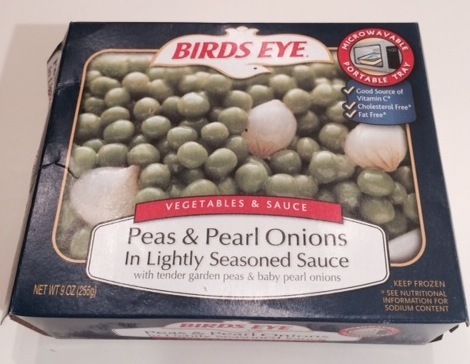 It happened on a night when his (long-suffering) wife Julie was (gratefully) out of town and Scott was making himself dinner, a meal that included a package of Bird’s Eye frozen peas with pearl onions. As he pointed out to me later, the picture on the package was of a quantity of lovely green peas dotted with three pearl onions. But when Scott later prepared the peas as instructed, he found only two pearl onions present in the entire box. Scott was understandably outraged. After spending $3.79 on a side dish one would hope to get the goods as promised per the photo that tempted you to buy the damn peas I the first place. Scott wrote an irate email to the appropriate parties (pea control at Bird’s Eye) and received an impressively swift reply. They were devastated to hear of Scott’s issue and would make restitution. Enclosed was a coupon for $3.79 towards the purchase of future peas. Once again, Scott saw red. He called me as I was walking down a noisy street in Manhattan but he was so heated up I could hear him over the construction of a new hotel on 44th Street. He said (shouted) that when his friend Garry objected to the saltiness of a certain brand of peanut butter manufactured in Vermont, he had written to the company and they had sent an apology with a case of the offending product. While this might seem passive aggressive—why would he possibly want a shitload of the same stuff that had bitched about?—Scott felt that this was a better outcome than getting a measly coupon. Scott said that while he’d prefer a large sum of cash—even a small appliance would be nice–he would be satisfied with a case of peas. If Julie didn’t want a pea festival in her freezer, well, there were dogs to be fed. In spite of his blossoming mental disorder, Scott was able to purchase another box of peas with onions, sans coupon. Those of us who love and care about him urged him to open the box ASAP to settle this thing so we could all move on to other things, like sleeping. Here is a Video of the Box Opening. Scott is now composing a letter to Bird’s Eye to demand that they get a grip on their sense of proportion. Hopefully they will send him $25,000 or, say, a lawn mower, and we can all get some peas and quiet. 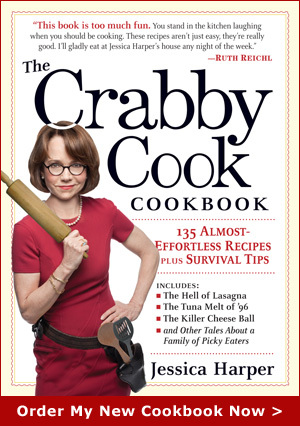 This entry was posted on Sunday, May 31st, 2015 at 4:47 pm	and is filed under Beside Myself, Cool Products, The Crabby Community. You can follow any responses to this entry through the RSS 2.0 feed. You can leave a response, or trackback from your own site. because complaining is so much more productive than playing solitaire when procrastinating. Man this could have been a Seinfeld episode! George Costanza would have been all over this one! One Onion!! You know were living in a society!!!! This new version of “too few vs. too many” unmistakably proves it once again: “the happy medium” is just a myth !